The final package will be announced on Wednesday, but it looks like homes with more than one adult will pay €178 — no matter how many adults live in the household. SENIOR MINISTERS DOING the rounds of the regular Sunday news programmes today continued to insist that nothing had been finally decided on the issue of water charges. However, neither Tánaiste Joan Burton or Transport Minister Paschal Donohoe took issue with the figures reported in this morning’s papers, which indicate the average charge will be well below €200 annually. One adult households will pay €76 in charges, according to the front page of today’s Sunday Independent. Homes with more than one adult will have to pay €178 — no matter how many adults live in the household. The Sunday Times also leads with the issue — focusing on the Government’s plan to abandon the need for people to hand over their PPS numbers to Irish Water. Instead, according to the paper, one adult per household will be able to register their PPS with the Department of Social Protection to qualify for a €100 universal support payment. The person will then declare how many others are living in the home. “No final agreement has been reached,” Tánaiste Joan Burton told RTÉ’s Marian Finucane this morning. She insisted, however, that the charge will be “modest”. I’m very confident that we will see a very attractive, reasonable package, which, when you put together the gross cost that people will pay via Irish Water, and if they wish —- it’s only if people wish — they will be able to apply for a water conservation grant per household of €100. 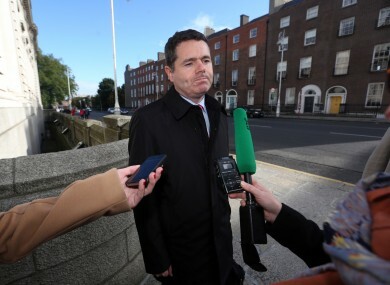 Donohoe, appearing on The Week in Politics, had less to say on the issue of charges, but didn’t disagree with the figures reported in the Sunday papers. I’ve heard the Tánaiste being pressed on what’s in the newspapers today and she has said, and I will say again, that all of this will be confirmed on Wednesday. Burton said the figures were being finalised following “lot of healthy democratic discussion” between the Government parties. The Labour leader also commented on the demonstration in Dublin yesterday that saw her trapped in her car for hours by dozens of angry protesters. Email “"€178 per year" .... Ministers are zeroing in on the final figure for water charges”. Feedback on “"€178 per year" .... Ministers are zeroing in on the final figure for water charges”.